This is such a gorgeous space! I love the creamy draperies and that navy velvet tufted bed owns me.... thanks for sharing! Love the silver furnishing pieces and that's bold statement of color! Have a wonderful weekend too Donna! That bedspread is beautiful! Love this! 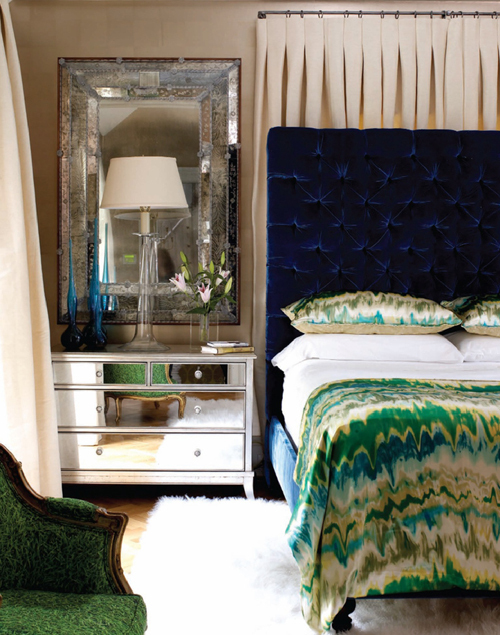 The velvet tufted headboard makes such a grand statement in this space. Beautiful! Love the mirror and the headboard.....wowza! I love everything... especially that midnight blue velvet headboard! Oh my... gorgeous....Happy weekend, xv. Good gravy, I can never get enough of the mirrored furniture. Such a beautiful room. Speaking of beautiful, I hope your weekend is just exactly that! This color combo, the textures and the pattern of that amazing bedspread are AMAZING. I love this look so much that it makes me dizzy. I would say I prefer the drapery to be hanged much higher with a neutral rail. The rest is really nice. ahhh that bedding! I die! Just stumbled upon your lovely blog, happy to be following now! Yep, those are the words! I just love the blue and green together! Nice Blog! if you have time pls come visit my blog. I just posted a new celebrity inspired makeup creation! And of course will be doing a review next week on my huge haul collection. take care & have a lovely day! Still on vacation in Oregon. I have a feeling you are taking some time off with your family as well! Enjoy every single summer moment! You said it! This is a stunner! Oh my goodness is right. Love love love that mirror. I just bought a chair for my desk at a garage sale, after seeing this I think I want to silver leaf it!